"Potato and cheese filling for Pierogi." This is one of the most refreshing receipes' I have found!!!! Great filling for my homemade Pierogi filling. My wife could not stop talking about my Pierogis! THIS IS SOO GOOD!!! 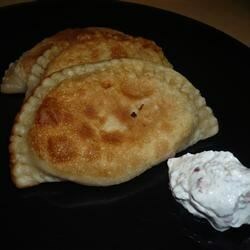 I used a sour cream, bacon, onion dip and it was a perfect match. I used 1/2 sharp cheddar and 1/2 medium cheddar. They were perfect - just like grandma used to make. I added sauteed onions, mushrooms and green peppers to the mashed potatoes, and I used Emmenthaler (a Swiss cheese) instead of Cheddar. The result was fabulous!